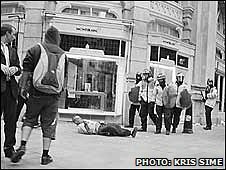 A man who died during the G20 protest was pushed to the ground by a police officer, video footage has shown. 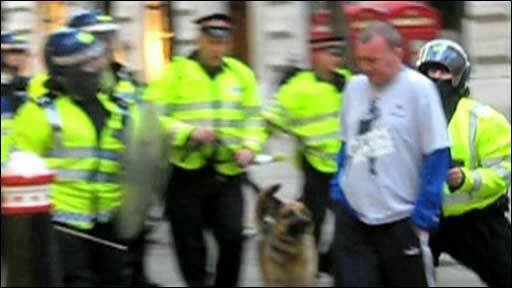 Ian Tomlinson, 47, collapsed from a heart attack during protests outside the Bank of England last Wednesday. Newsagent Mr Tomlinson, who was not protesting, is seen receiving a two-handed push from a police officer. A New York fund manager recorded the footage, saying he came forward with the video because Mr Tomlinson's family "were not getting any answers". The pictures were shot at 1929 BST at Royal Exchange Passage. They are believed to be the last of Mr Tomlinson alive. Initially, the pictures show Mr Tomlinson walking away from a group of police officers. He lands heavily on the ground before remonstrating with police. Daniel Sandford, BBC Home Affairs correspondent, said: "Campaigners have been saying all along that Mr Tomlinson's heart attack may have, in some way, been linked to how the police were treating protesters that evening. "This is now going to raise some more serious questions about the police behaviour on that night. "Why is it that one of the officers walks up to a man who appears to be walking away from him? "He [Mr Tomlinson] does not look like he is 100% co-operative but he is not being unco-operative." The Guardian newspaper obtained the footage and it plans to hand the video to the Independent Police Complaints Commission (IPCC). An IPCC spokeswoman said: "The IPCC has been made aware of the footage broadcast on a national newspaper's website. "We are now attempting to recover this evidence. We will be assessing this along with the other statements and photographs that have already been submitted." Earlier, Mr Tomlinson's family made an appeal for witnesses. A statement from the family said: "Ian was a massive football fan and would have looked distinctive in his Millwall top. "He was probably on his way back from work to watch the England match and got caught up in the crowds."